I have done Chained Bar, the TAST Week 51 Stitch on one of the unfinished Christmas Stockings. I worked 4 lots of bars along the seam so that they crossed back and forward acrosse the seam line but the undulations formed are so slight that they are barely visible. This seam on the same stocking has always annoyed me because the front of the train is chopped off but tonight when I was working on te chained bar stitch I realized that the front of the train would still be in the seam which means that by unpicking the seam and nicking the fabric either side of the section that I wanted I could lift the train over the seam in the same way that I did the design on the Pink block. 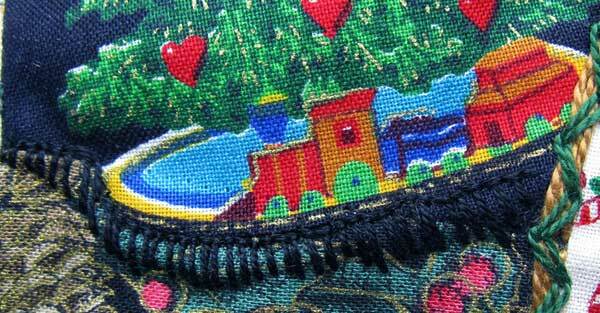 To finish the seam I did a black buttonhole stitch which extends the black background around the train.